Plan To Replace Mubarak May Be In The Works Mideast analyst Stephen P. Cohen, who has been in touch with Egypt's leadership, says two of the Egyptian president's closest allies are working on a two-step plan that would see the removal of lawmakers whose election was seen as illegitimate and the organization of new elections. 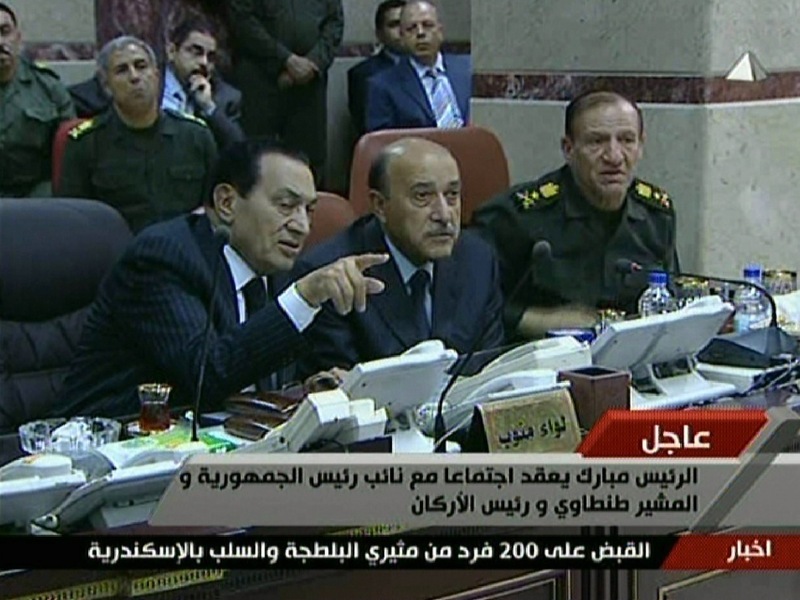 An image grab taken from Egyptian state television shows Egyptian President Hosni Mubarak (left) speaking with his new Vice President Omar Suleiman (center) and Chief of Staff Sami Anan during a visit to the military operations center in Cairo on Sunday. Two of Egyptian President Hosni Mubarak's closest allies, his new vice president, Omar Suleiman, and his defense minister, Hussein Tantawi, are quietly working on a plan under which Mubarak would step down from power, according to a U.S. scholar who has been staying in regular touch with the Egyptian political and military leadership. "They want to be sure that Mubarak is going to cooperate," said Stephen P. Cohen, president of the Institute for Middle East Peace and Development and a longtime confidant of Egyptian and Israeli leaders. The two-part plan, according to Cohen, would involve the immediate removal of 100 members of the Egyptian Parliament whose election this past fall was seen as illegitimate. They would be replaced by 100 candidates who were barred from running in the election or who were defeated because of government meddling in the election process. A second possible step would be the organization of new parliamentary and presidential elections. The plan, according to Cohen, "requires [Mubarak] to give up his office." Asked whether Mubarak would do that, Cohen answered, "He is getting ready to do so." In an appearance on state television Monday, Suleiman said Mubarak had asked him "to immediately hold contacts with the political forces to start a dialogue about all raised issues that also involve constitutional and legislative reforms." He did not say such reforms would involve Mubarak stepping down from power. Until now, the Egyptian armed forces have been a pillar of Mubarak's support. But Cohen says the military leaders are now more concerned with their own institutional interests and the future of the Egyptian state. "They are not now concerned about maintaining Mubarak's power," Cohen said. "They are very concerned about maintaining the legitimacy of the military among the people who are engaged in these demonstrations." In a sign that Mubarak may have lost the army's support, the Egyptian high command Monday issued a statement saying it considered the demands of the street demonstrators in Egypt "legitimate" and promising not to use force against the Egyptian people. Suleiman brings to these discussions a long history of involvement in delicate Middle East negotiations. He has been Mubarak's principal representative in discussions with the Israelis and the Palestinians, and he has mediated between the rival Fatah and Hamas factions of the Palestinian leadership. He also has close contacts with Saudi and Iraqi leaders, and he has met often with top U.S. military and political officials, including Secretary of State Hillary Clinton, Adm. Michael Mullen, the chairman of the Joint Chiefs of Staff, and Army Gen. David Petraeus, formerly the head of the U.S. military's Central Command. "Omar Suleiman is careful, calculating, shrewd, obviously extremely intelligent," said David Mack, who served as deputy assistant secretary of state for Near Eastern Affairs in the administration of George H.W. Bush. "That comes across when you speak to him." Suleiman's leadership in crafting a way out of Egypt's dangerous political stalemate is characteristic of his experience, Cohen says. "He's a strategic thinker," he said. "He is trying to design a strategy that would allow the changes in Egypt to take place peacefully without further bloodshed and would not split the army and the people. They know that if there is a split between the army and the people that would damage the whole structure of the legitimacy of the Egyptian state." The question remains, however, whether the Egyptians now demonstrating in the streets would accept a compromise plan like the one Suleiman and Tantawi are now proposing. By design, their proposal would keep the Egyptian army in a dominant position in the country's politics. Some demonstrators have called for much more sweeping political change in Egypt. A related question is who would represent the anti-Mubarak opposition in any negotiations. Mohamed ElBaradei, the Egyptian diplomat who most recently served as chief of the International Atomic Energy Agency, has claimed a mandate to speak for the opposition, but neither he nor anyone else has taken a commanding lead of the movement as a whole. Cohen, however, sees that as a potential advantage for Suleiman and Tantawi as they negotiate a compromise political solution for Egypt. "It makes it easier," he said. "They not fighting against someone who expects to become president."